Welcome back to the work week! 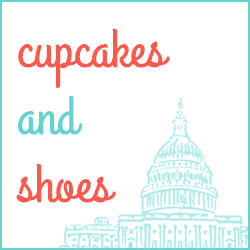 Did you find any good Presidents' Day deals? I stopped by the J. Crew outlet to see if the mini link pave bracelet was still there, since some of you were worried it might be out of stock, and I found several! With or without a sale, it's a steal, so get them while you can! I popped up to Pittsburgh for a quick visit with Megan, whom you may remember from my very first job in the Pentagon, as well as my very first Britney Spears concert. She's a mom now, and I couldn't wait to meet her little snuggle bug. It snowed most of the drive up and continued during my visit, but we Washingtonians are seasoned vets at this snow thing by now, so it was easy peasy. I have to admit, though, that when I returned home yesterday, I was surprised to see the snow in DC was still pretty hefty, and then I heard on the radio that we were getting more last night! What is going on?! This is. Apparently we have lots more of these types of winters in store. 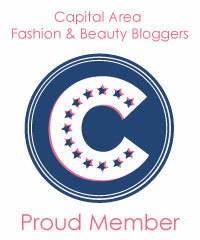 Stock up on Vitamin D and bronzer! While I, along with everyone, am so ready for spring to spring, these unseasonably cold months and snow days have forced me to stare at my apartment a lot and figure out creative ways to make it more bearable to be stuck in it. 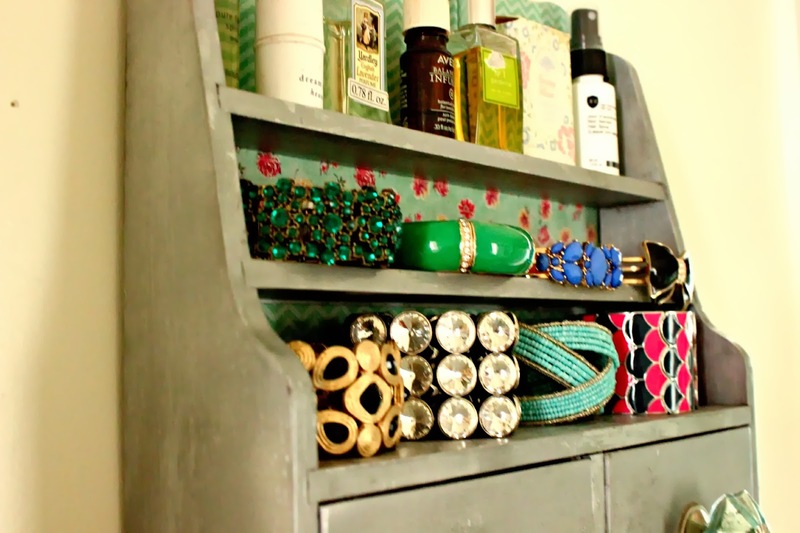 My first major project was a coat hanging station; second was a new TV stand; and third was a jewelry station in my bathroom. 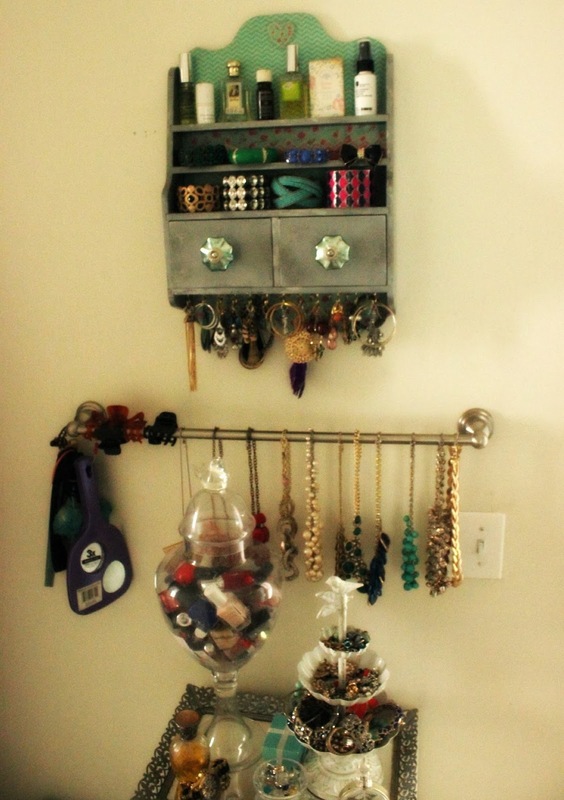 Like my coat hanging station, I needed a place to put things -- namely, my jewelry. 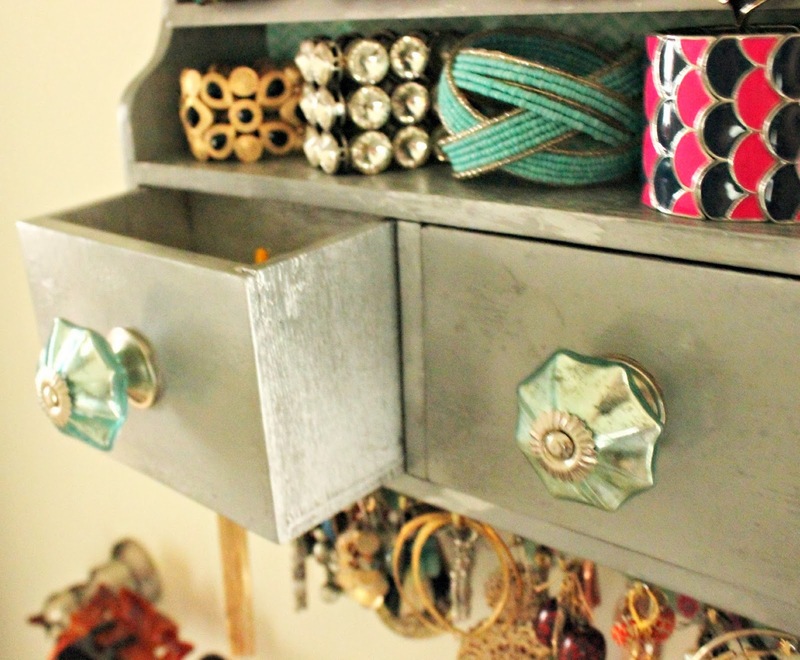 I was inspired by a local blogger who was recently featured on The Every Girl's "Home Tours" and used an apothecary jar to store her bracelets. 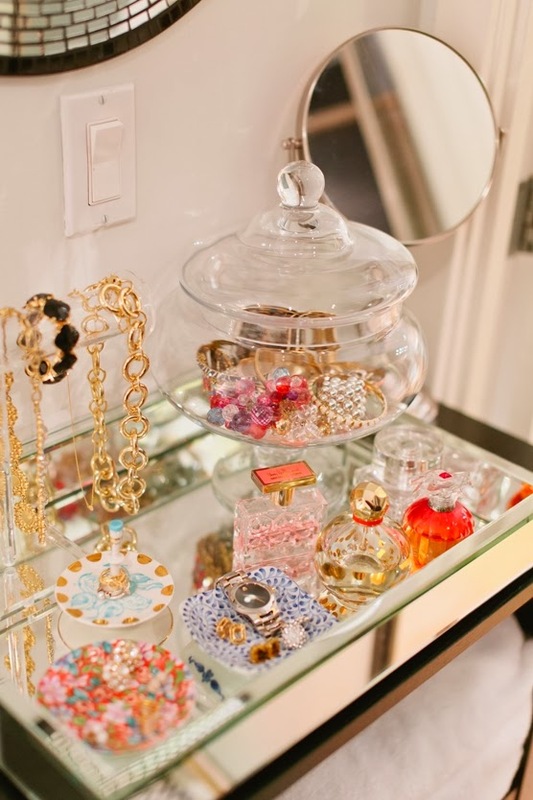 She put the jar and some other things on a mirrored tray, and the whole look is sophisticated and, I imagine, makes her feel pretty when picking out her jewelry. Here's my attempt -- albeit not as glamorous, but I didn't buy anything, only used what I already had, and I haven't mastered my new DSLR yet so I blame it on the photos. First was they tray. I remembered I had an antique silver mirrored tray under my bed. I cleaned it and put it on top of my little cabinet, and that whole wall instantly looked better. 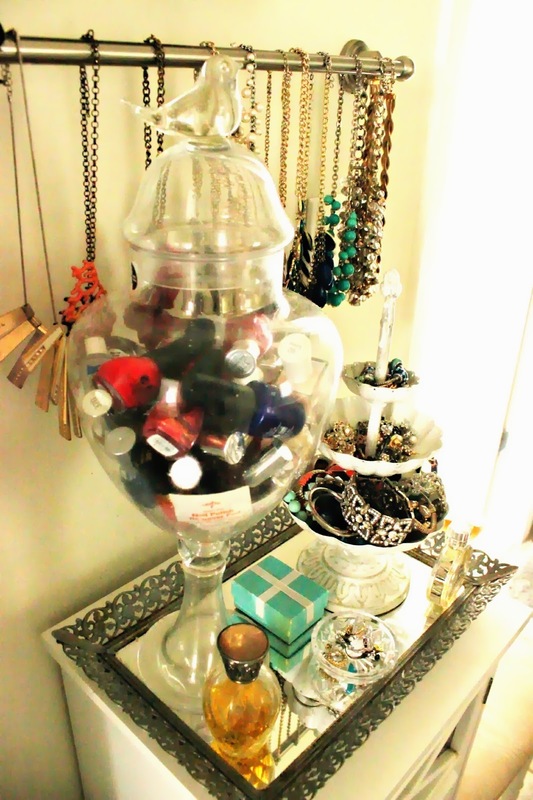 I have a similar apothecary jar that I've been using to hold my nail polishes for a while, based on a Pinterest pin I saw last year. It's actually not the best way to store nail polishes, as some of them tend to spill out if they're upside down, but since I don't have a better way to store them right now, I decided to keep it as is. I bought this tiered candy dish for a bridal shower I hosted last year, and I've only used it once since (for another bridal shower). As I was looking around my apartment for things to use for this project, it dawned on me that I don't only have to use it to hold candy. The more I thought about this and compared it to the inspiration picture, I realized one of the draws of the inspiration was that it looked like a candy store for city girls. So I put most of my bracelets and my stud earrings in it. Ahh! Isn't it fun?! 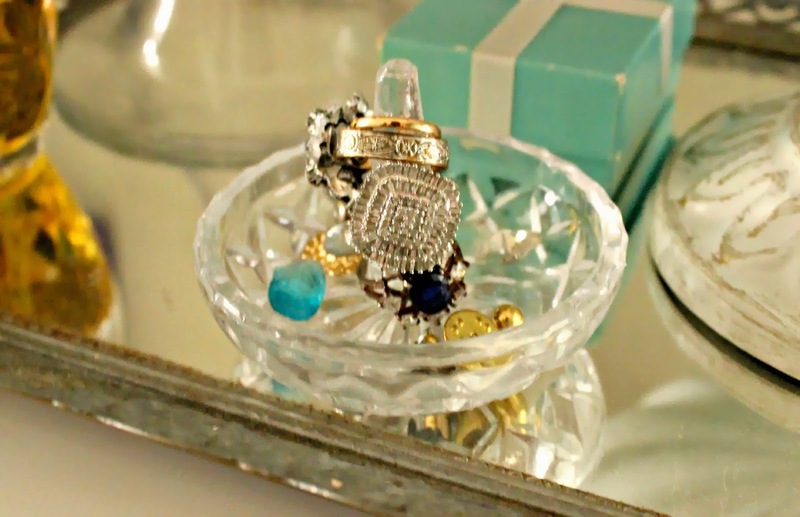 I have a glass ring holder that has been sitting on my bathroom counter for a while. I was using it to hold rings, but it wasn't displayed nicely. This is another vintage piece I inherited and I've seen similar ones at Urban Outfitters lately. 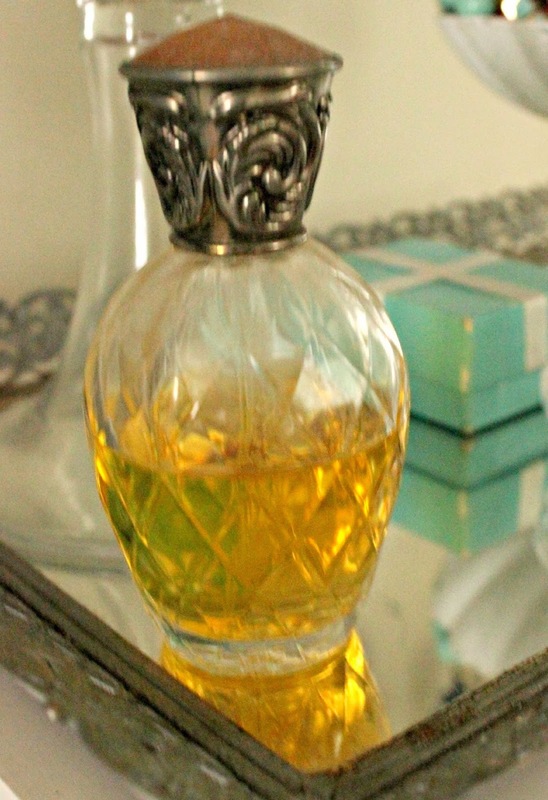 ...and the prettiest bottle -- a Jessica McClintock scent that is too strong for everyday use. I also put a Tiffany's solid parfum on there because every jewelry candy store should have a Tiffany's box. 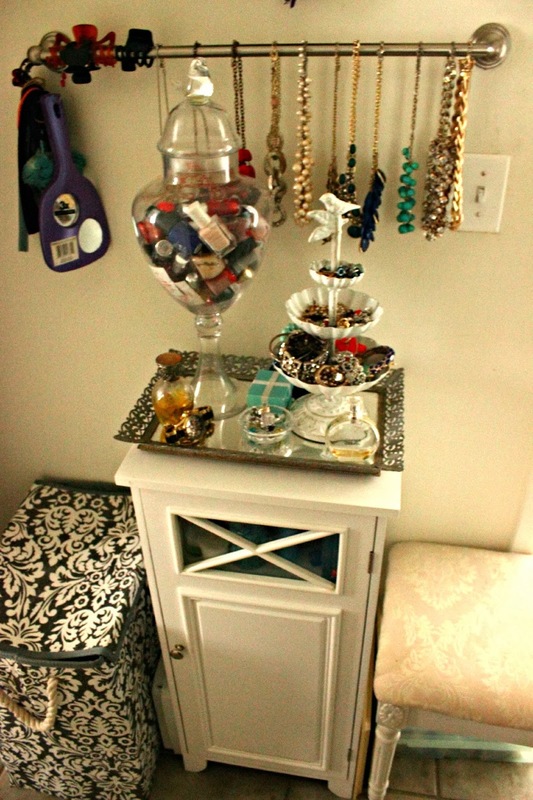 My bracelets and rings were good to go, but I still needed a place for necklaces and earrings. The placement of my bathroom's towel bar has always bugged me (behind the sink instead of next to it) so I figured out a new place for my towels (will reveal in another post) and made it a necklace bar. 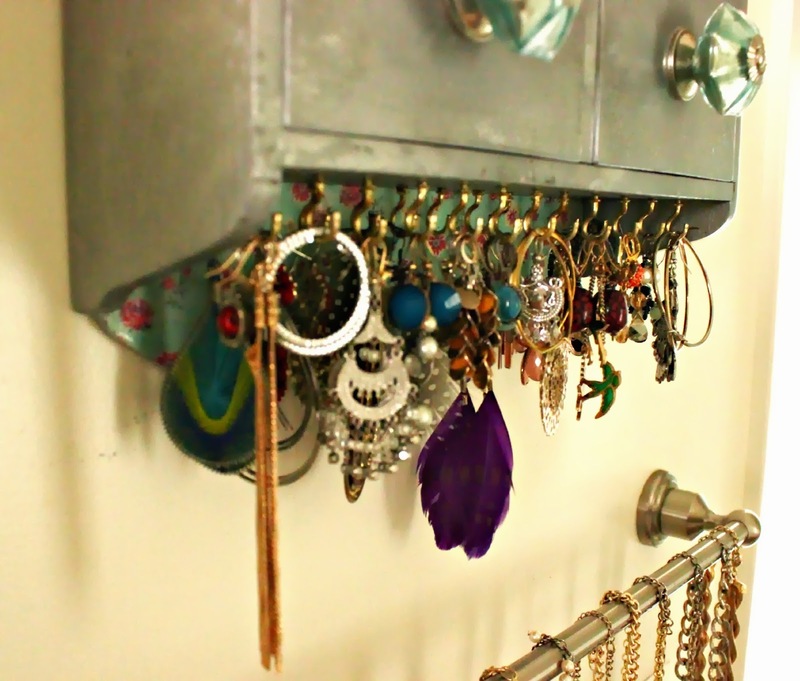 Finally, I decided to implement one of the hanging jewelry organizers I made for my Etsy shop to hold a few more bracelets and my earrings. Several of my bracelets were too big or inflexible to fit nicely in the candy dish, so these little shelves were a perfect place to display them. 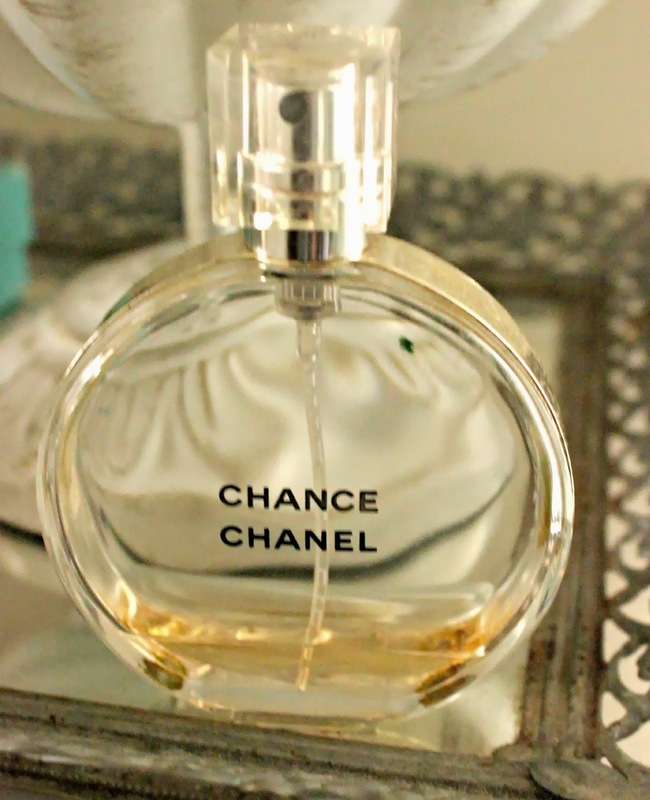 The top shelf was too narrow for bracelets, so I used it to place small bottles of other fragrances. 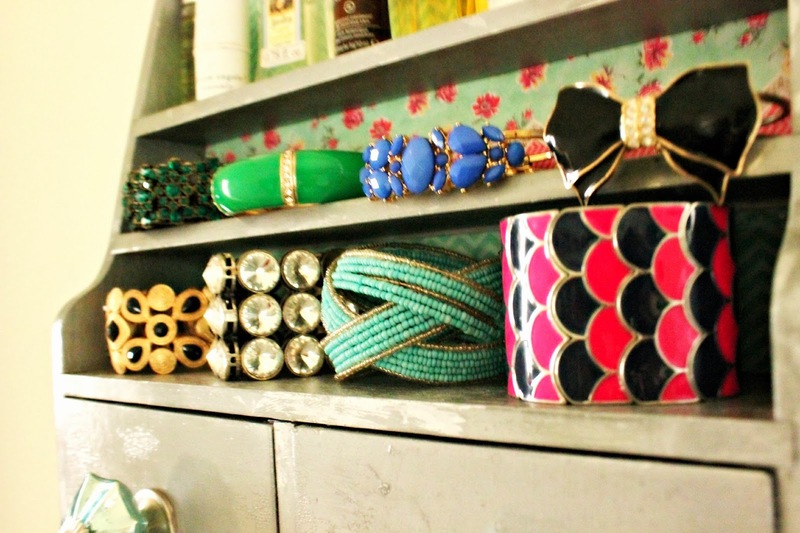 In the drawers I keep jewelry bags and boxes for quick retrieval when I'm traveling. I've really enjoyed my jewelry station so far. 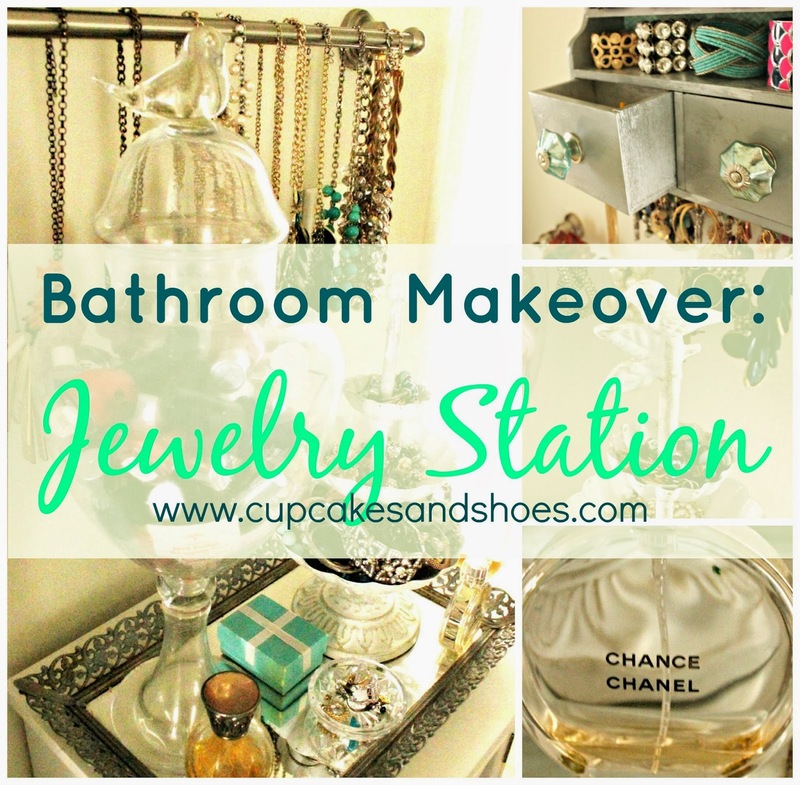 It feels great to have it more organized, it's more fun (and less stressful) to pick out accessories each day, and it makes my bathroom look cleaner and brighter. This is great, I love it! I've been meaning to update my storage somehow lately, maybe I'll use yours for inspiration! Hey friend- as someone who has a jewelry business- please consider the humidity in the bathroom. 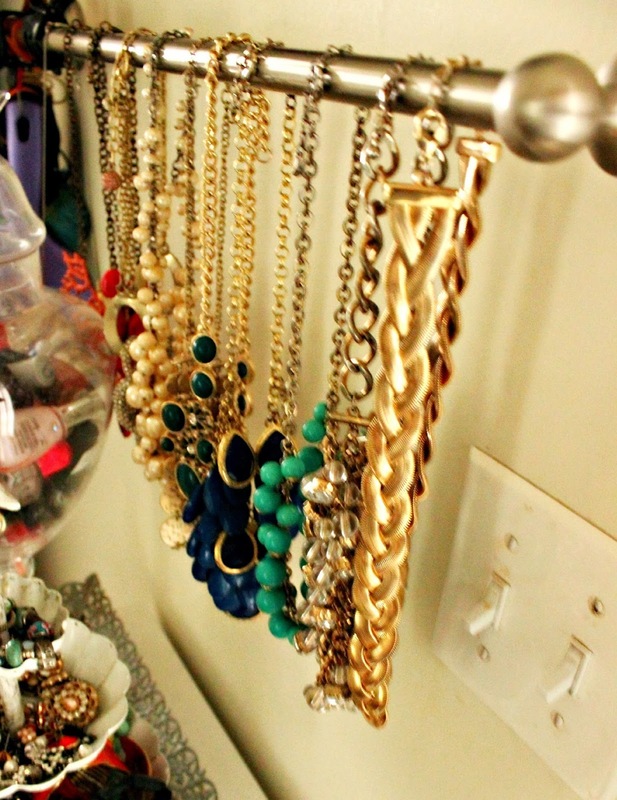 Typically I tell people not to store jewelry there. If nothing else, make sure to air it out constantly, keep the bathroom fan going, etc. 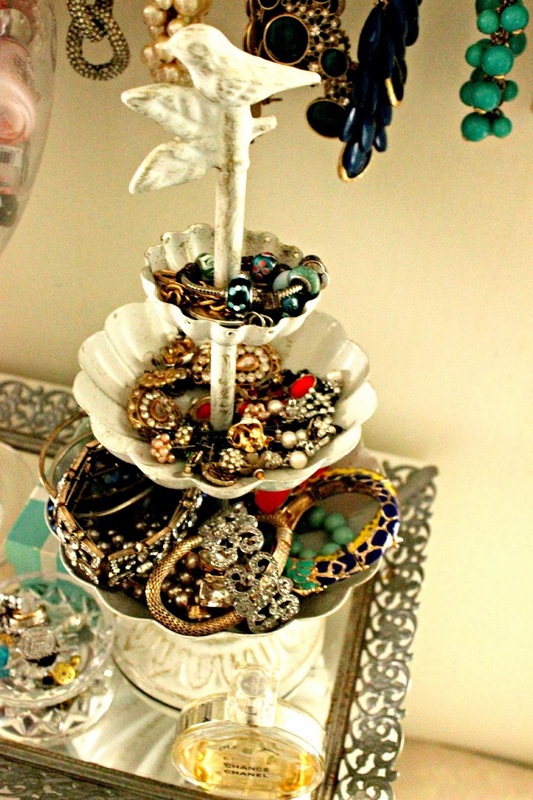 Things will tarnish and ruin, especially costume jewelry. Oooo please share if you do! Good point, and I've wondered about that before. I've seen this happen to a couple of my necklaces after a few years, but they don't typically tarnish quickly. Maybe because I keep a fan going? Tiny apartment living sure can be challenging! such great ideas! 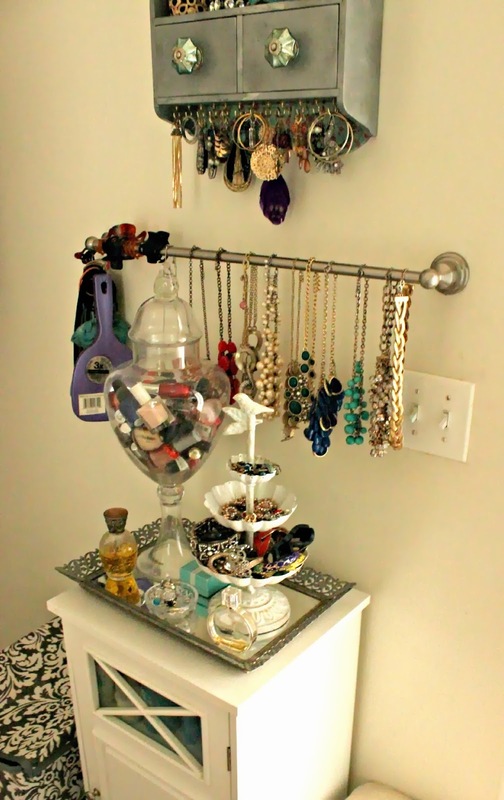 I've been looking for a place to store all my necklaces (they were hanging in empty picture frames on my wall, but I've been trying to "de-girlify my room for Matt), and LOVE the towel rack idea! I'm stealing it!